Transferring money from one country to another can be both slow and expensive. Currently, most international remittances are made using the SWIFT (Society for Worldwide Interbank Financial Telecommunications) network. SWIFT does not actually transfer funds. Instead, it allows financial institutions to communicate with each other in a reliable and secure manner. What is the amount of money that is transferred using SWIFT? That’s difficult to say, but consider the fact that in January 2018 alone, over 639 million “FIN” messages – a message that transmits financial information from one financial institution to another – were exchanged. In 2016, world merchandise exports totaled US$16 trillion. Commercial services accounted for an additional US$4.77 trillion. Most of these funds were transferred using the SWIFT network. The institution, which is a cooperative society based in Belgium, has over 11,000 members. A majority of banks and financial institutions use its services. The American company would instruct its bank to make the transfer to the Chinese company. This local bank may not have access to the foreign financial markets. It would use a correspondent bank in the US as an intermediary. The American correspondent bank would, in turn, contact a bank in China. This may not be the supplier’s bank, but another correspondent bank. The Chinese correspondent bank would then transfer funds to the supplier’s bank. The entire process could take several days and could involve various intermediaries. It may also require large sums be held by the correspondent banks on behalf of the bank to which it is providing a service. The bank holding the funds refers to this as a nostro account. This same account is called a vostro account by the counter-party bank. Not only would a fund transfer of this type need several days to be completed, it would also require certain compensation to be paid to each intermediary. The entire process is tedious and expensive. 4 Will Bitcoin and other cryptocurrencies replace the banks? 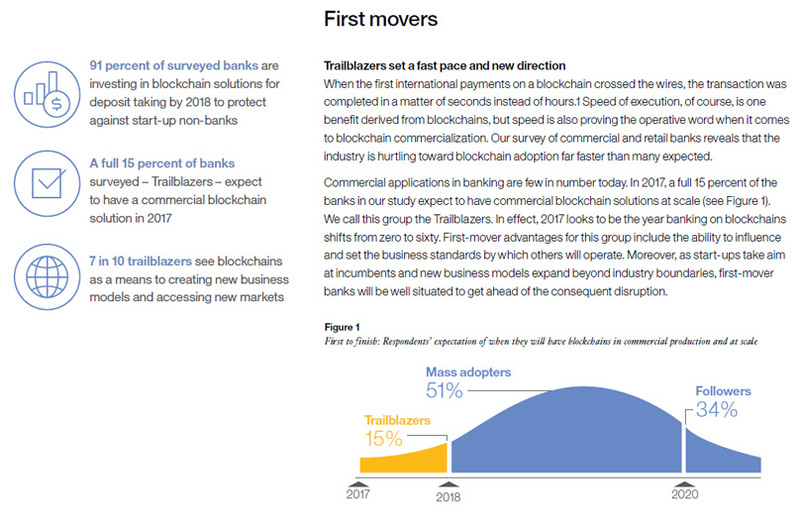 A recent paper titled Leading the pack in blockchain banking: Trailblazers set the pace points out that several international banking organizations expect blockchain technology to have a major impact on their business processes. The paper is based on a study carried out by the IBM Institute of Business Value and the Economist Intelligence Unit. It involved a survey of 200 banks in 16 countries. Almost 70% of the banks that were part of the study said that the blockchain would greatly reduce the time and cost of international payments. In a new initiative, several of the world’s leading banks have joined forces to design an absolutely new blockchain-based digital currency. Their objective is to create a utility settlement coin that will clear and settle transactions using the blockchain. The list of banks that are part of this consortium include Barclays, Credit Suisse, Canadian Imperial Bank of Commerce, HSBC, Mitsubishi UFJ Financial Group, and State Street. The project was initially started by UBS in coordination with Deutsche Bank, Santander, Bank of New York Mellon, and NEX. If this effort meets its goals, it will allow for fund transfers to be completed in a much shorter timeframe than is currently possible. Another initiative to speed up payments involves a tie-up between Citi and Nasdaq. The new venture will provide users with direct access to global payments from Nasdaq’s Linq platform using CitiConnect for Blockchain. The facility will allow for cross-border multicurrency payments and real-time visibility of payment transaction activity. According to the Pew Research Center, a nonpartisan American think tank based in Washington, D.C., an estimated US$574 billion was remitted by migrants to their relatives in their home countries in 2016. How much does it cost to make these remittances? Remittance Prices Worldwide, an initiative promoted by the World Bank, which monitors remittance prices across all geographic regions of the world, reveals how expensive this service can be. Its December 2017 report states that the global average cost of money transfers stands at 7.09%. 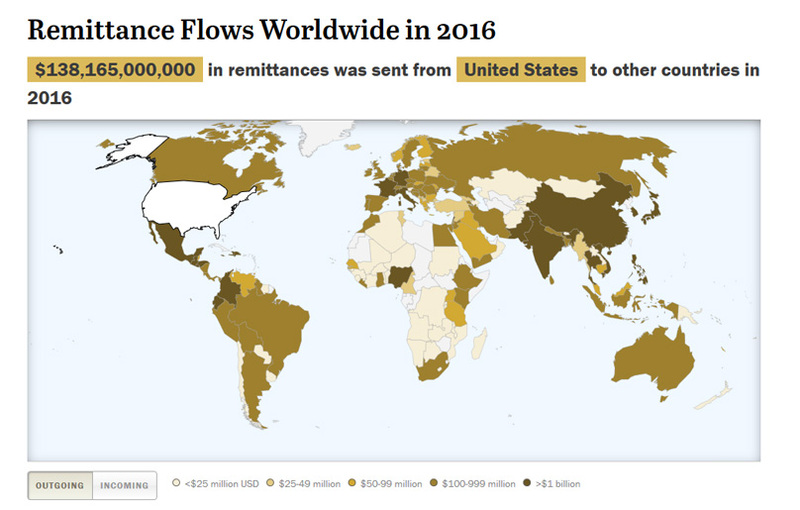 Remittance Flows Worldwide 2016, Image from PEW Research Center. But regional variations can be huge. A remittance to Africa from the US or from Europe can cost an extra 15%. Within Africa itself, the fees for money transfers can be extremely high. An article in Fast Company, an American business magazine, says that transferring 33,000 Angola Kwanza, which is worth US$200 from Luanda to Namibia costs a quarter of that sum in fees. Abra, a company that was launched in 2014 in Saratoga, California, intends to solve the problem of expensive international remittances. It doesn’t use the international settlement system to transfer payments. Instead, it uses bitcoin. A user simply loads money from a bank account into a mobile phone wallet. 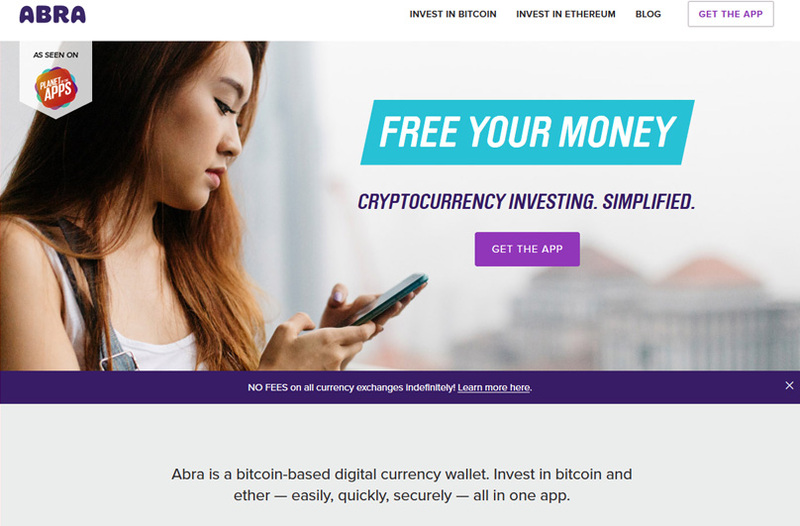 Abra then converts these funds into bitcoin and transfers them across the blockchain. The person at the other end receives funds in the local currency. The unique feature of this service is that the customer does not know that money has been transferred using bitcoin. The service was initially launched for transferring funds from the US to the Philippines. The company currently offers cash services in the Philippines and services linked to a bank account in the US. Bitcoin transfers can be made from any country in the world. 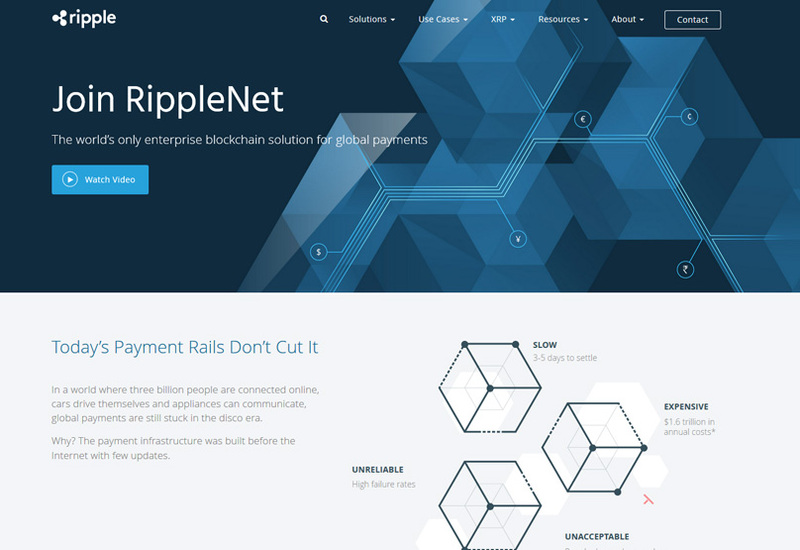 Ripple is a company that promises to bring the real power of the blockchain to the money transfer industry. 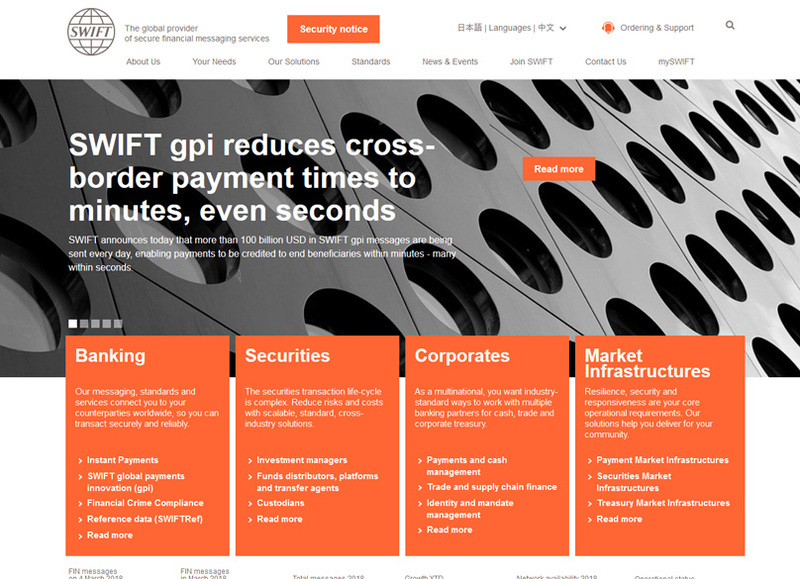 It provides a low-cost service that is much faster than traditional remittance methods. The value of its cryptocurrency, XRP, has seen a steep rise in the recent past. In the beginning of January last year, one XRP was worth US$0.006368. Today, it trades at US$0.959368. That’s an increase of 15,000% in less than 15 months. American Express – this leading US bank is testing Ripple’s real-time payment system. It has provided some of its corporate customers based in the US with access to Ripple’s blockchain tech for transferring money to the UK. Japan Bank Consortium – a group of 61 Japanese banks has initiated a pilot project that involves two Korean banks. The project will use Ripple’s technology to transfer funds from Japan to Korea’s Woori Bank and Shinhan Bank. MoneyGram – the Dallas-based money transfer company will use XRP through the recently launched Ripple service called xRapid. Will Bitcoin and other cryptocurrencies replace the banks? It’s unlikely that any single digital currency, or even a bunch of them, will take the place of the traditional banking system in the area of international remittances. What’s more likely to happen is that cryptocurrencies will be increasingly used for back-end settlements. That’s because the advantages that the blockchain offers are simply too great to ignore. Marwan Forzley, the founder and CEO of Veem, a startup that provides a platform for business to business payments, points out that the blockchain can solve three key issues that currently confront the money transfer industry, “Tracking – an end-to-end view of transfers that you can’t get out of wire transfers. Evaluate the evolution of crypto currency and how they affect international payments?